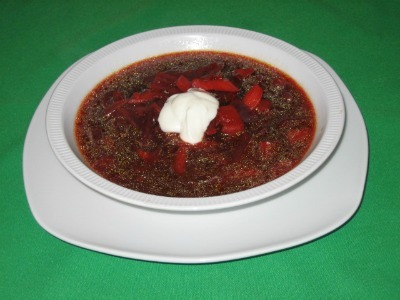 This diet beet soup is a magnificent creation that offers a one of a kind flavor just by adding two extra ingredients. This tasty meal is also perfect when dieting as it is low in calories and offers much needed nutrition during those times. We now know that the benefits of beets are many when it comes to maintaining good health. It is high on the list for being a liver loving food, helps detoxify the body, improves liver function and has been used in the treatment of cancer, illness and fatigue. One more huge plus, yes, this is another great homemade meal that can be made in about 30 minutes. In a soup pot heat oil over medium heat and sauté onions, garlic and bay leaf for about 4 minutes until translucent. Add beets, carrots, potatoes and continue sautéing for another 3-4 minutes. Then add the beef broth and bring all ingredients to a boil, reduce heat and simmer for 20 – 30 minutes or until vegetables are tender. Remove bay leaf and add salt and pepper to taste. By adding these two extra ingredients, horseradish and sour cream, you create a beet soup that has a one of kind unique flavor, above and beyond the rest of them. Impress your family and your friends with this recipe. Want to make your own delicious horseradish, then click here to go to our page on "How to Make Homemade Horseradish". We recommend adding the horseradish and sour cream separately to each serving just in case for those who may not like it (unlikely but possible). If you don't have any beef broth handy just substitute the broth for water and add about 3 beef bouillon cubes. For a more filling meal serve this dish with a side of garlic bread or tasty dinner rolls.